Trainer Chris Waller won his third Group 1 race of the Queensland Winter Racing Carnival with the unbeaten colt The Autumn Sun in the Group 1 $600,000 Jaguar Land Rover J.J. Atkins Plate (1600m) at Doomben today. The Autumn Sun, above, kept his unbeaten record intact with a win in the J.J. Atkins Plate at Doomben. Photo by Steve Hart. The Autumn Sun ($4 favourite) was only having his third race start when he proved too strong for his more seasoned stablemate Zousain ($6) to give Waller another Group 1 quinella. The well backed Fundamentalist ($5) ran home strongly to gain third place. 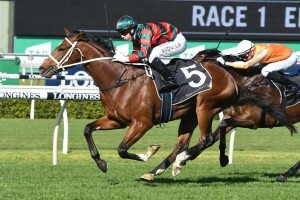 Waller also quinelled the Group 1 $650,000 Hardy Brothers Doomben Cup (2000m) with Comin’ Through and Egg Tart and the Group 1 $500,000 Treasury Brisbane Queensland Oaks (2200m) with Youngstar and Another Dollar. Winning jockey Kerrin McEvoy said that lightly raced The Autumn Sun still has a lot of improvement but that he still felt very strong underneath him. “He oozes quality and he is nowhere near the ceiling yet. He is on the improve,” McEvoy said. The Group 1 $2m Ladbrokes Caulfield Guineas (1600m) at Caulfield during the Melbourne Spring Carnival looks a nice Spring target for The Autumn Sun. “A little earlier in the day I was thinking about things that could go wrong,” Waller said.